Capri, together with Ischia and Procida, is the one of the three main islands of Campania, a region in Southern Italy with an area of about 13,500 km² and a population of 5,836,317 (2016). The distinctive features of the region are its mild climate, the abundance of art and historical sites, the strong passion for music and food as well as the presence of Mount Vesuvius, one of the most active volcanos in Europe located in the Gulf of Naples. Overlooking the Tyrrhenian sea, many leisure tourism destinations developed over the years in Campania, such as Capri, Amalfi, Positano and Sorrento; besides Naples, which is the regional capital. Capri’s area spans over approximately 10,5 km2, while the number of inhabitants of the two municipalities (Capri and Anacapri) is about 15,000. Its precipitous coast and its numerous caves give a very peculiar configuration to the natural setting of the island. Similar to the region of Campania, music, food and history arepresent, but what established the island as such an attractive tourist pole is the exclusivity and the “dolce vita” that visitors experience during their stay, through the maritime life and the nightlife, which certainly revolves around the timeless “piazzetta”. The charm of this island has been knownsince the Roman Empire. Some of the first known admirers and visitors of Capri were the Emperor Augustus, that made the island his private dominion, and the Emperor Tiberius, who built 12 properties to retire from Rome's life, some of them are still visible today. The current touristic status began with the two World Wars, where the island hosted many political figures which gave birth to a small political-literary oasis. After that, a gradual change of the island’s economy was accomplished through a progressive decline in agriculture and coral production in favour of the tourism sector. Being an island, Capri can be accessed by air or by sea. The closest airport is Naples International Airport, about 10 km far from the city’s port, while the nearest train station is Naples Railway Station, about 4 km far from the city’s port. By air: Capri features a heliport in Anacapri, the upper part of the island, and the main routes are from Naples (20 minutes), Rome (70 minutes) and Ravello (20 minutes). By the sea: the island can be reached by ferry or hydrofoil, in 50 minutes from Naples, 25 minutes from Sorrento or Positano, and one hour from Amalfi. Once on the island, the main square is accessible by car or by public means of transportation (funicular and bus), whereas the shopping streets nearby can be accessed only on foot since they are located in a pedestrian area. 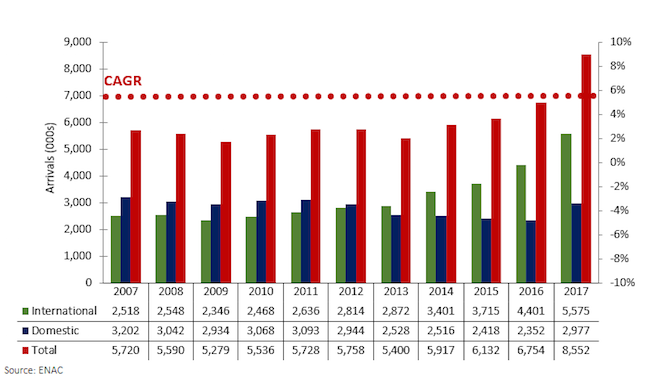 Passenger movements at Naples Airport have been increasing at a moderate pace over the past 11 years. The Compound Annual Growth Rate (CAGR) for the examined period was 4.1 %on average, due to a sustained growth of the international inflow, which was 8.3%. 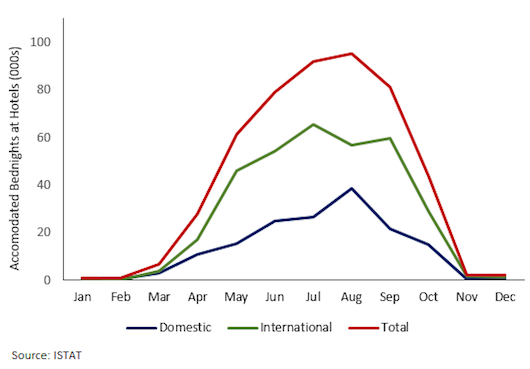 At the beginning of the period, international passengers were less than domestic ones at a roughly 45:55 ratio, while after 2010, domestic travelers recorded a steady decrease up until nowadays, where the ratio has been transformed to approximately 65:35 in favor of international visitors. 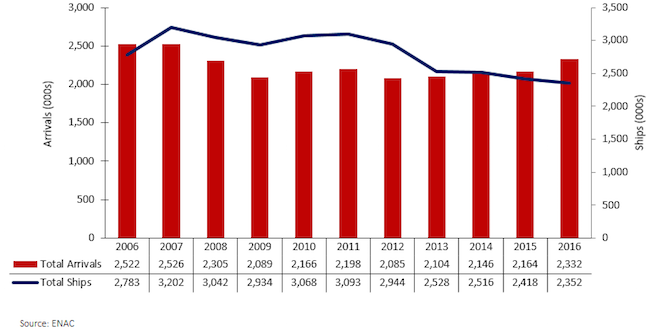 This slump in domestic traffic occurred most probably due to the national economic downturn and, at the same time, due to the growth of the high-speed train connections amongst Italian destinations. Furthermore, after volatile growth between 2008-13, general traffic shows stable growth since 2013, and 2017 results registered a vigorous increase of 26.6% compared to the same period in 2016. Naples’ airport occupies seventh place in Italy for volume of passengers and features 36 carriers amongst flag bearers and low cost carriers. Currently, according to the ACI Europe Award, it is the best airport in Europe in the category 5-10 million passenger airports. Further, supporting investors’ belief in Capri’s value, several investments have materialized, such as the opening of the first Capsule Hotel in Italy in Naples (open 24/7) and the decision by Michael O'Leary, CEO of Ryanair, to extend the number of routes from 19 to 28 starting from summer 2018, reaching two million passengers per year only by Ryanair. Although Naples Airport connects Italy with many countries, Capri's international tourists typically to stop in other Italian destinations such as Rome, Florence, Venice, Amalfi and Positano Coast cities before or after joining the island. Therefore, the most common way to reach the island is by sea through approximately nine different connecting routes from different ports of Campania (such as Naples, Amalfi, Sorrento and Positano). The island constantly receives more than two million tourist arrivals by its Sea Port every year ranging between 2.5 million in 2006 and 2.3 million in 2016 after a fluctuating period. Figures 1 and 2 represent the traffic flows to Naples (by air) and to Capri (by sea). Nowadays, tourism accounts for more than 10% of national GDP, and in 2016 Campania ranked 7th amongst all Italian regions in terms of bednights (approximately 19 million). Campania is one of the best known and most sought-after tourist destinations in Italy. With its diverse cultural heritage, landscape, environment, and ecosystem, it can meet a wide range of needs and provide a variety of destinations to visitors such as cultural and historical sites as well as beach destinations. Figure 3 depicts domestic and international visitation and accommodated bednights for Capri. Throughout the entire period of 2006-16 most visitors at hotels in Capri were of international origin. During the examined decade, international bednights increased from representing 60% of the total market to 68%. The high number of international visitation to the region can be explained by the fact that this area is one of Italy's prime destinations for international travelers. In general, the total number of bednights at hotels on the island has experienced a CAGR of 1.3% in the examined period, from approximately 470,000 in 2006 to about 535,000 in 2016. When compared to the aforementioned seaport statistics, it becomes evident that a large number of disembarking travelers are day visitors, that spend only a few hours on the island. Domestic bednights decreased at a sustained pace, showing a negative CAGR of -1.8%, while in the same period international bednights rose at a CAGR of 3.2% showing remarkable resilience. The decreasing domestic bednights could be most probably attributed to the decrease in disposable income of Italian citizens as a result of the economic crisis that has affected the country. Additionally, due to its international character, Capri is considered an expensive destination for Italians, who then seek alternative places within their country to spend their holidays. The main international source market in Capri is the United States of America that in 2016 captured a share of 18% of total bednights, almost three times higher than the markets of Germany and the UK. Nonetheless, special attention should be brought to Brazil and Australia which achieved a CAGR of 13.1% and 15.5%, respectively, though from a much lower base. At the same time, bednights from Japanese guests declined recording a negative CAGR of -8.7%. Capri displays a typical seasonality pattern for a leisure destination with peak season extending from end-June to end-August, high-season in May, June, and September, while April and October are considered the shoulder season. Most hotels on the island match their seasonal inauguration of operations with the Easter holidays, while they close either in mid- or end-October depending on the weather conditions. , Annual operation is almost impossible however due to the rough sea conditions not allowing for daily connection by the sea, in conjunction with the closing of most of the tourism-related businesses such as restaurants, bars and so forth. The island is also visited during Christmas holidays, but mainly by people who own properties there; in fact, almost all hotels remain closed in this period. During 2009-16 overall hotel supply has not changed dramatically, in fact, it appears fairly stable with a CAGR of 0.5%. The quantity of four- and five-star hotels has slightly increased whereas, combined together, they represent more than 75% of the island’s total room inventory in 2016. On the other hand, hotels of lower classification experienced a negative trend losing some 100 rooms over the last eight years. Even though the number of four- and five-star properties has increased in absolute terms, the average size of five-star hotels reduced from about 60 rooms in 2009 to 50 rooms in 2016 while the size of four-star hotels was reduced from 38 to 35. Growth in the higher segments of the market is attributed to the demand of guests looking for higher quality services, while on the other side hoteliers realise that in order to keep their properties competitive, they ought to offer such services. The increasing interest in developing five-star hotels can also be attributed to the needs arising from the tourism inflow of affluent travellers from countries with emerging economies, in conjunction with the positioning of the destination as a more upscale one. Nonetheless, the total supply is mainly characterized by independent hotels, or by small national groups, whereas the international branded properties are less established on the island. In general, the destination is characterised by being relatively fragmented, with demand outpacing supply, whereas the various building limitations on the island enhance this phenomenon. Furthermore, thefalling number of lower classified hotels could also be attributed to the expanding sharing economy, where property owners on the island rent their homes through online platforms; thus, satisfying the demand for accommodation of price sensitive clientele and competing with hotels of lower classification or, in some cases, even with four-star hotels. 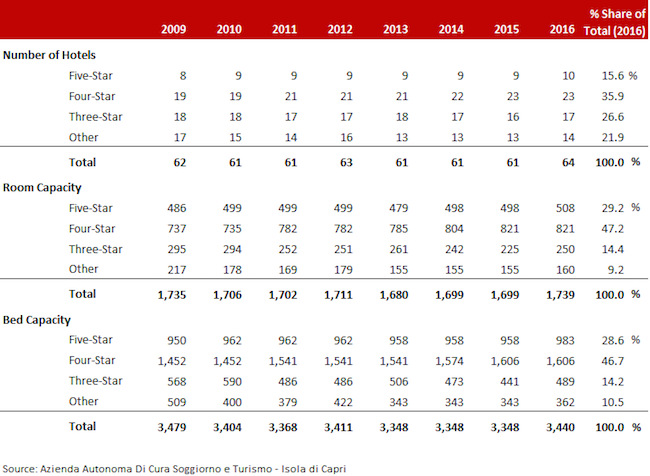 Figure 6 summarises hotel supply in Capri over the past eight years. Figures 7 and 8 summarise the important operating characteristics of four- and five- star hotels in Capri. The charts set out the average occupancy, average daily rate (ADR), and rooms revenue per available room (RevPAR) for a sample of eight four-star hotel properties and five five-star hotel properties. For consistency reasons, despite the seasonal operation of the specific hotels, all occupancy percentages refer to 365 days of operation. 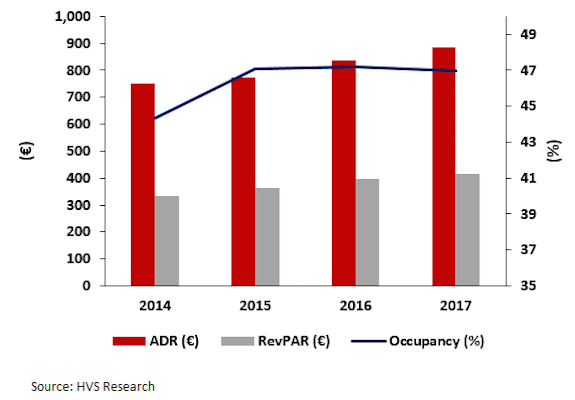 The four-star hotel market shows a sustained growth of both ADR and RevPAR, respectively at 4.0% and 6.4%, while the occupancy is showcasing a constant but slow improvement at around 2.3%. This trend is probably due to the growth in BnB type businesses, which affecti the four-star market’s occupancy as well, impling an increase in ADR is a defense method to preserve revenues in Capri. Regarding the five-star hotel sample’s growth, the trend is positive in this case as well. The four years of occupancy and average rate data witnessed a CAGR of 2.0% and 5.7% respectively, leading to cumulative increase of the RevPAR by 7.8%. This phenomenon could be attributed to limited new additions to current supply, together with the growing number of arrivals and bednights, helping existing properties to push toward higher ADR levels. Capri is clearly a popular tourist destination because of its charm, history and its natural configuration. The island is currently constrained by its seasonality, which is essentially a seven-month period that experiences a high-point in July and August with average annual occupancy levels ranging from 43% for four-star properties (approximately 75% seasonal occupancy) to 47% for five-star properties (approximately 82% seasonal occupancy). Capri remains unique and is high on tourists' lists of 'must see' destinations. Currently the hotel supply seems stable, mainly due to the difficulties in obtaining the permits to build new hotels on the island. Thus, the current hotel market is characterized by relatively small-scale properties, mainly managed by boutique hotel operators, and usually affiliated with renowned brand consortiums in an effort to increase sales, while the lack of international hotel operators is obvious. The increasing demand for alternative accommodations also contributes to the pressure on the lower segments of the hotel market, including some four-star hotels as well. 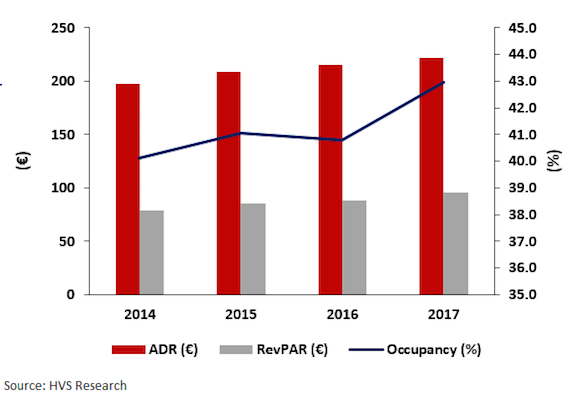 As for the hotel performance, during the last years Capri’s four- and five-star hotel segments have experienced positive growth in both ADR and occupancy, at about 3 - 5% per year. Finally, corporate demand in the market is present during the shoulder season (comprising mainly incentives and events from domestic corporations), but visitation is primarily leisure-driven. The port zone is often overcrowded during the day, due to the high number of daily tourists who leave the island after a quick tour, and in fact only 10% of the annual registered tourists stay for at least one night, presenting Capri’s biggest challenge. Ezio Poinelli is Senior Director of HVS Southern Europe, head of HVS office in Milan and supervising HVS activities in Italy and Spain. He has more than 19 years experience in Hospitality, Real Estate, and Leisure Real Estate markets in Europe, Caribbean, Latin America, and South Africa. He joined HVS in 2010 having significant experience in executive positions at Northcourse Advisory Services (Wyndham Worldwide), Ernst & Young, and other companies in the hospitality and real estate field. He is a graduate in Economics and Business Administration and holds a M.Sc. in Tourism Economics from Bocconi University. Pavlos Papadimitriou is an Associate Director with the Athens Office of HVS specializing in hotel valuation and financial consultancy, and a member of the Royal Institution of Chartered Surveyors. He joined HVS Athens in late 2007 after completing the MBA programme of Les Roches School of Hotel Management in Switzerland and a BSc in Marketing and Communication from the Athens University of Economics and Business. Since then, he has conducted a number of valuations, feasibility studies, and market research analyses in the Balkans, Cyprus, Georgia, Greece, Italy, Poland, Spain, and Turkey. Carlo Reitano joined HVS in 2017 after receiving a Bachelor Degree in Economics and Management at LUISS (Rome) and a Master in Tourism Economics at Bocconi University (Milan). His activity includes both on-the-field and desk work conducting market analysis and feasibility studies in the hospitality industry.